The horror genre is a film genre that has been around for quite some time, spending his filmmaking illustrious history of producing a plethora of scary thrills, ghostly chills, and creepy macabre as its narrative based and cinematic nuances. While this genre has been more towards adults (over the years), the movie genre has blended into an unexpected one, tapping into the PG realm of young kids / tweens cinematic entertainment. While not uncommon, this blend of kid’s horror movies (which sometimes also adds the fantasy element into the mix) has been sparsely produced over the years, but has been able to cultivate some memorable features with films like 1984’s Gremlins, 1986’s Labyrinth, 1988’s Beetlejuice, 1993’s A Nightmare Before Christmas, 2006’s Monster House, 2009’s Coraline, 2012’s Hotel Transylvania, 2015’s Goosebumps just to name a few. Now, Universal Pictures (as well as Amblin Entertainment and Reliance Entertainment) and director Eli Roth present the newest kid horror endeavor with the movie The House with a Clock in Its Walls. Does the film join the memorable ranks of the kids fantasy horror features or does it get lost within its own “ticking” narrative? 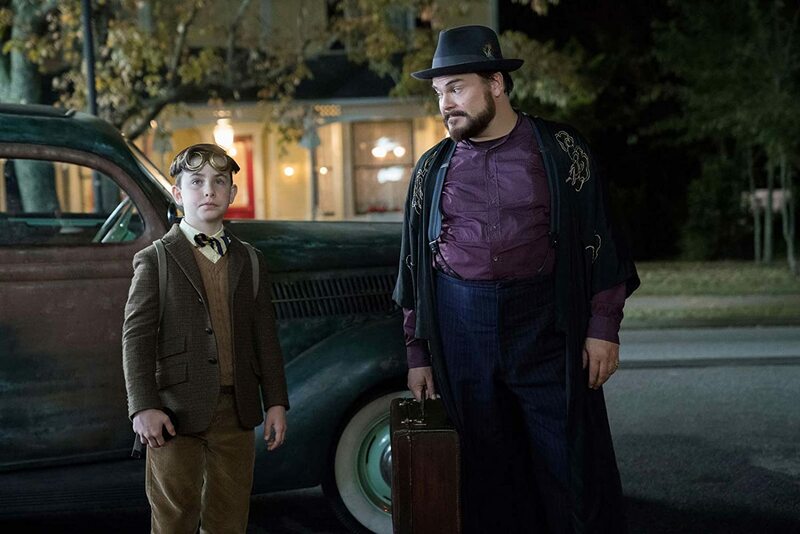 After losing both of his parents in car accident, 10-year boy Lewis Barnavelt (Owen Vaccaro) is sent to live with his uncle Jonathan (Jack Black) in Michigan. However, while Lewis just wants a normal life, his uncle’s house is far from that idea; filled with ticking clocks, creepy objects, and other strange oddities. Though, nothing is scarier than an ominous “ticking” the seems to be coming from within the house’s walls. After confronting his uncle, Jonathan reveals to Lewis that he’s a warlock, and his next-door neighbor / friend Florence Zimmerman (Cate Blanchett) is a witch, though her power’s have waned due to some misfortune. Lewis pleads for Jonathan to teach him magic, and (eventually) his uncle relents, teaching the boy in the mystical arts of magic. As his magical education continues, strange and scary things start to happen around Lewis, especially concerning his uncle’s house and the murder of the man who lived there before Jonathan, which are first brought up by Lewis’s fellow classmate Tarby (Sunny Suljic). Eventually, Lewis learns that identity of the man was a warlock named Isaac Izard (Kyle McLaughlin), who died under mysterious circumstances. Unfortunately, Lewis and Tarby drift apart as friends and, in an effort to win him back, Lewis reveals his magical abilities in attempt to “wow” Tarby. In doing so, Lewis summons a great evil that, along with the ominous ticking of the clock in the walls of Jonathan’s house, could bring an unspeakable destruction to the world. Of course, this leads me to talking about The House with a Clock in Its Walls, the latest 2018 endeavor from Hollywood to adapt a YA children’s novel. For those who don’t know, the film is based on the 1973 children’s book of the same name by author John Bellairs. It should also be noted that the Bellairs The House with a Clock in Its Walls novel is the first in a series (titled the Lewis Barnavelt novels), with the latest installment (The Sign of the Sinister Sorcerer) being released in 2008 by author Brad Strickland (Strickland continued on the series after Bellairs in 1991). To be honest, I’ve actually never heard of Bellair’s Lewis Barnavelt series, despite me working in a bookstore for the better part of a decade. I guess it was one of those children’s novels that sort of fell through the cracks of my glancing at it (I usually scan through YA (Young Adult) / Children’s books from time to time). Of course, this means that I didn’t read the Bellair’s book before seeing the 2018 movie as I never knew it even existed. Thus, my review for The House with a Clock in Its Walls is gonna be strictly based on the movie itself and on what was added and / or changed from its original source material. Naturally, I remember seeing the movie trailer when it initial came out and was definitely intrigued by it. Of course, the story’s premise (shown from the trailer) looked interesting, but the real “kicker” was seeing actor Jack Black and actress Cate Blanchett together, which certainly seem like an “odd pairing” of sorts, especially if one considers the very different types of films that they each do. That alone, made me super curious to see this movie when it got released. So (as you can imagine), I decided to see this movie and to check out if the film was just as promising as its trailers made it out to be. What did I think of it? Was I right? Well, for most part, The House with a Clock in Its Walls is solid magical kid-friendly horror feature that is lead by some strong performances from both Black and Blanchett. It does falter in some areas, but the movie itself is a favorable choice for those young tweens that are looking to get into “horror” genre and not get super scared by it. The House with a Clock in Its Walls (I’m gonna abbreviate it to “THWACIIW” for most of the review post because that’s a mouthful of a name to keep on writing), is directed by Eli Roth, whose previous directorial works includes movies like Cabin Fever, Hostel, and Green Inferno. To me, however, I always remember Roth from his acting role as Sgt. Donny Donowitz from Inglorious Basterds. Anyways, given his attraction to more adult horror-ish / gory endeavors of late, it’s kind of interesting to see Roth sort of “shift gears” in helming a film project like THWACIIW. To his credit, Roth succeeds in most areas, tackling a kid-friendly horror feature that’s walks a perfectly fine line between being scary and being lighthearted. To be honest, THWACIIW is a familiar story of sorts; with a lot of common narrative elements and similarities that many can see, including Harry Potter, Practical Magic, 13 Ghosts, and A Series of Unfortunate Events. However, what separates that from being a “knock-off” endeavor is that fact that Roth makes the feature stand on its own merits; never feeling like its borrowing too much or laying heavily on such commonly used tropes (in both a kid’s fantasy movie or a horror flick). Further separating itself is Roth’s knack for drumming up some horror sequences in the movie. Again, THWACIIW is aimed at the young tweens demographic and the film certainly does cater to them in some of its morals and thematic storytelling moments, but it also utilizes that particular age range introducing the horror genre, especially given the subject matter of the film’s narrative. There’s plenty of kids’ mischief horror frights and scary that is perfectly suitable that Roth displays on-screen as well as some of the common kid’s fantasy-esque themes, especially noticeable to Lewis’s introduction to magic and becoming a young Warlock hopeful. Like I said, there’s plenty to like about, especially when the film enters its third act and Roth seems adept in making the film feel “spooky” without going to gory / violent scares that will frighten the movie’s younger viewer audience. In the technical category, THWACIIW is a pretty solid endeavor, presenting a kid’s feature that has plenty of magical wonderment and spooky thrills within its overall “look and feel”. I do have to say that the film’s art direction team (Andres Cubillan, Walter P. Martshius, and Thomas Minton) should be mentioned for bring a certain creative nuance in making Jonathan’s house quite spooky (in its conceptual designs) as well as production designs by Jon Hutman and set decorations by Ellen Brill and Tommy Wilson for bringing their concept pieces to life. Truly, the house itself (in all its various rooms and corridors) is definitely a character in the movie and certainly has that sort of “spooky wonderment” in the film. Additionally, the film’s s costumes (done by Marlene Stewart) are properly utilized in for the film’s 1950’s styles and the cinematography work by Rogier Stoffers does create some fun sequences of creative camera angles. Also, before I forget, the film’s score, which was composed by Nathan Barr, is also pretty good, producing some great musical piece throughout the film (be it light / tender moments or some spooky / action filled scenes). Problems do arise within THWACIIW, which makes the film stumble a few times with its drawbacks. Perhaps the most notably one is the movie’s pacing, with several parts being uneven. The film itself, which runs about 105 minutes in length, moves along at a brisk pace, moving along from one sequence to the next. However, the first two acts seem a bit uneven, with sparse moments that hold more of a “set-up” of events that actually carrying the movie. This includes several subplots that don’t exactly pan quite well like Lewis’s time spent at school, befriending fellow classmate Tarby and vague introduction of other fellow classmate Rose Rita Pottinger. It seems like there could’ve been more to them, but Roth doesn’t seem interested in them, which makes Lewis’s time in school kind of boring and almost unnecessary. Coinciding with that, another problem is the house itself. While I mentioned above, that Jonathan’s house is indeed intriguing and full of mystery, the movie never fully invests in showcasing the “in’s and out’s” of the enchanted dwelling beyond a few snippets (mostly shown in the film’s first two acts). I’m not saying what’s presented is adequate, but I kind of wanted to see more of the house itself as well as Lewis discover more of the “weird” and “magical” nuances throughout this enigmatic house. The movie held my interest (and attention), but it seemed like the narrative being told seems, more or less, rushed. This prevalent when Roth (as well as the film’s screenplay done by Eric Kripke) seems to go into character backstories and exposition of certain events. There’s some explanation that unfolds, but what is lacking is depth and characterization, with the film somewhat glossing things that are suppose to be important (i.e. Jonathan’s relationship with Isaac, Florence’s tragic past, Selena Izard backstory, Isaac’s backstory, and maybe even possible more insight into film’s cinematic take on magic itself). Again, there’s plenty to talk / discuss that Roth nor Kripke never fully present, which does make certain area in THWACIIW feel like there’s something missing (be story elements or character context). As I stated, the film’s pacing is off, lagging at times as the narrative moves forward. Luckily, the film’s third act is the true saving grace of the feature, which brings a lot of fantasy-horror elements to life. Lastly, the film’s overall tone is sometimes wonky. Yes, there are some creepy stuff that happens in the movie and certainly does work well. However, that being said, it sometimes clashes with some of the more lighthearted nuances. I mean to have a kids’ movie that’s about necromancy, raising the dead, and monsters and then to have comical potty humor…. it just seems problematic (tonally wise). The cast in THWACIIW boast some recognizable faces within its cast; none more prevalent and considered the feature’s “big-ticketed” stars than actor Jack Black and actress Cate Blanchett in playing the characters of Jonathan Barnavelt and Florence Zimmerman respectfully. Black, known for his roles in School of Rock, Nacho Libre, and Kung Fu Panda, seems like the more “comfortable” (of the two) in a role like this, playing up Jonathan in way that’s atypical for the actor to perform in. Black certainly does bring his inherit quality of style to the feature (i.e. comical), but also does a have a bit of dramatic bits in the movie, which does make his character of Jonathan very likeable. As for Blanchett, known for her roles in Thor: Ragnarok, Ocean’s 8, and Cinderella, she does surprisingly well in movie. While she’s definitely is a talented actress, Blanchett mostly appears in more “Oscar” type movies and not so much in kid’s movies. However, given her recent roles in both Cinderella and Thor: Ragnarok, Blanchett seems to be venturing more into a family friendly territory in her acting career and certainly does make that known when she plays character Florence Zimmerman in THWACIIW, playing up some of the film’s more serious bits as well as being comical in a sort of witty banter remarks from Black’s Jonathan. When paired together, both Black and Blanchett excel, creating a great rapport with each other that’s quite magnetic on-screen. As stated above, it’s a bit odd to see this actor / actress paired in a movie, but it works tremendously great and is easily one of the best (and most memorable) things in THWACIIW. The only problem with these two is not so much their acting abilities (or the way the handle their respective characters), but rather in how Kripke’ s screenplay doesn’t delve deep enough into the backstories of both Jonathan and Florence. There’s substance there, but the movie doesn’t venture down that path. The third main characters (behind Black’s Jonathan and Blanchett’s Florence) is the character of Lewis Barnavelt, who is played by young actor Owen Vaccaro. Known for his roles in Daddy’s Home, Mother’s Day, and Fun Mom Dinner, Vaccaro somewhat nails the classic architype character of a story like (i.e. the loner / odd main protagonist character in a fantasy-esque situation). However, of the cast, Vaccaro ends up being the weakest one. He holds own, but ends up being more of a weaker / less-interesting character, which is strange to say because he’s the actual main character of THWACIIW. It’s also must be stated that the movie never truly makes him an “oddball” that the movie inclines him to be, which I blame more on the film’s writing than in Vaccaro’s performance. In the end, Vaccaro’s Lewis is okay in the movie, but could’ve been better handled and most certainly gets outshined by Black and Blanchett’s performances. Behind those three main characters, the only character that stands out (at least to me) is the film’s main antagonist character Isaac Izard, who is played by actor Kyle MacLachlan. Known for his roles in Twin Peaks, Dune, and Blue Velvet, does provide enough of a creepy villain (especially for a film’s narrative setting such as this movie), but the character gets mostly pushed aside until the film heads into the third act. 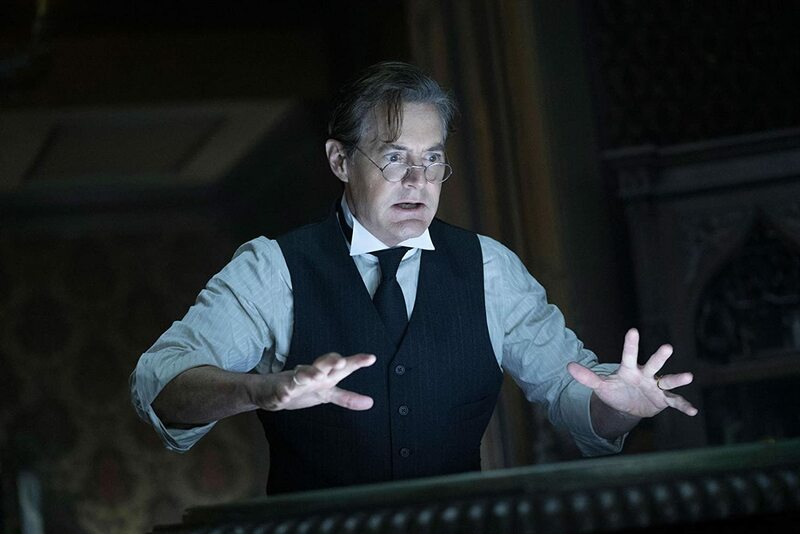 Thus (again), I don’t blame MacLachlan’s performance, but rather the lack of character depth into Isaac Izard. The rest of the cast, including actress Renee Elise Goldsberry (Altered Carbon and One Life to Live) as Isaac Izzard’s wife Selena, actress Collen Camp (Clue and Silver) as Jonathan’s nosy neighbor across the street Mrs. Hanchett, actor Sunny Suljic (The Killing of a Sacred Deer and God of War (he does the voice of Atreus)) as Lewi’s classmate Tarby Corrigan, actress Vanessa Anne Williams (Dynasty) as Lewi’s classmate Rosa Rita Pottinger, and actress Lorenza Izzo (Feed the Beast and Knock Knock) as Lewi’s mother, round out the supporting players of the feature. Unfortunately, while most (if not all) give solid acting performance in their respective roles, most of these characters are written and / or presented rather thinly, with majority of the screen time focusing on the main players in the film (Jonathan, Florence, Lewis, and Isaac). Thus, most of these characters, just are “cogs” in the movie’s narrative machine (servants to the story at hand) and perhaps could’ve been easily expanded upon. 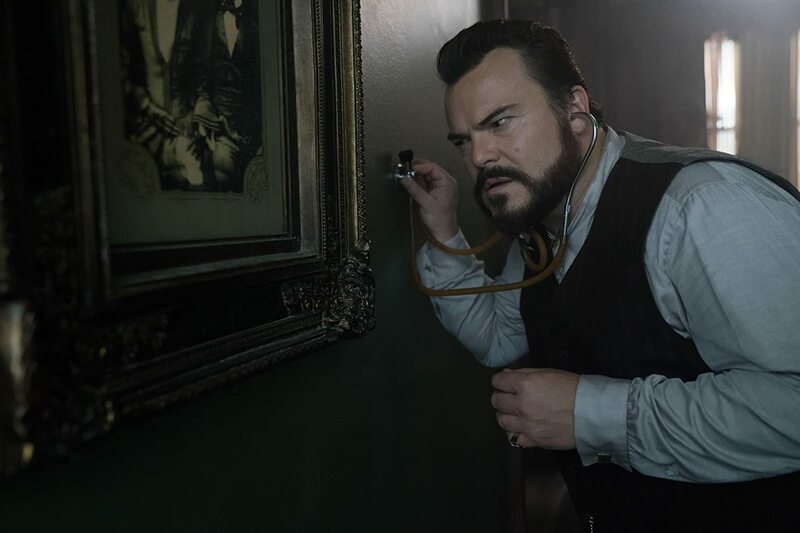 Lewis goes to live with his Uncle Jonathan and discovers that his uncle’s house has a dark secret within its very walls in the movie The House with a Clock in Its Walls. Director Eli Roth’s latest film takes a stab into the foray kid / family movies, bringing to life John Bellairs’s classic children’s book to the silver screen. While the movie does stumble in its pacing and lacking several insight / substances areas in both character and story, the film ultimately succeeds in being a solid endeavor for a kid’s fantasy / horror feature, with special thanks to some of the cast (Black and Blanchett), the film’s visual aesthetics, and the whole kid’s horror nuances that work in the movie’s favor. To me, the movie was pretty good. It did have a few problems, but (for the most part) I found the feature to be enjoyable “kid-friendly horror” fun for young tweens out there (in a good way). Plus, I loved Black and Blanchett in the movie. Thus, I would say that I would “recommend” this movie or (at the very least) as a solid / favorable “rent it”. 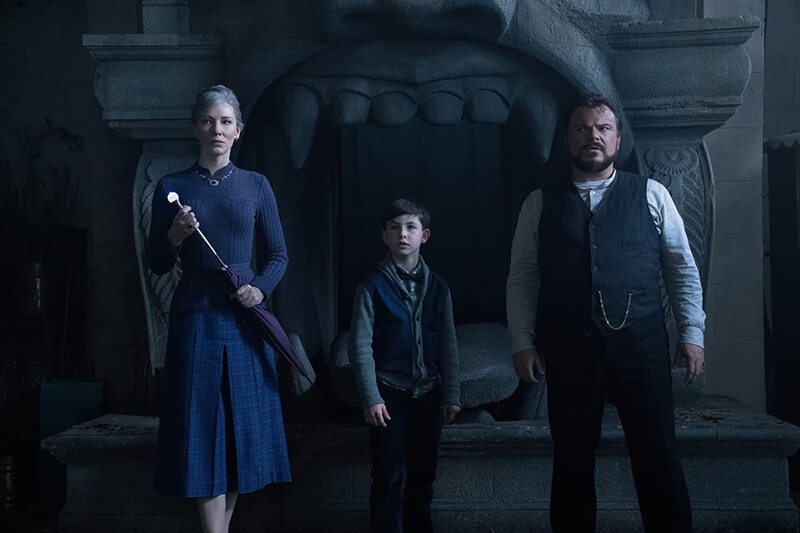 In the end, while Hollywood will continue to produce and churn out many children’s / kids’ movies (be it original ideas or adapted from a book series), The House with a Clock in Its Walls is nice reminder of seeing something both a bit different and familiar and still make it an engaging feature. It doesn’t strike a powerful resounding chord, but it’s entertaining ride that will surely strike its target audience members that are looking for some “magical spooky fun”. While this one looks like it might be good, I just don’t know if there’s anything in it for me. I’m probably one of the few that doesn’t care for Jack Black. Sometimes I’ll chuckle at a scene but mostly I don’t get it when it comes to his comedy. This movie seems like an unfortunate love child of Labyrinth and Willy Wonka (my apologies to two greats Wilder and Bowie for the analogy). It also didn’t help that the trailer for this came on when I took the kids to see Hotel Transylvania 3 and it scared the daylights out of 2 of the 3 with me. Yes it is the same rating, but it takes quite a fool not to see the difference in the toon “violence” and the spooks that this trailer showed. Really turned me off to the movie (and a few theater employees to feel my wrath).